LAS VEGAS, Sept. 20, 2018 -- Smallworks Press, an independent publishing company specializing in limited edition, exquisitely-printed books focusing on contemporary art and culture, announced today that it has been selected to produce and distribute the highly-anticipated photography collection of Will Roger, a cultural co-founder of Burning Man. What started with a few people burning a human effigy on a San Francisco beach in 1986 has become a global phenomenon with an eight day event of more than 70,000 people and associated Burning Man regional events around the world. The temporary Black Rock City, located 100 miles northwest of Reno in Nevada’s Black Rock Desert, is home to Burning Man, a festival dedicated to art, community, anti-consumerism and self-expression. The 2018 festival concluded on Labor Day weekend, Sept. 3. Compass of the Ephemeral: Aerial Photography of Black Rock City through the Lens of Will Roger is scheduled for release in April 2019. The work includes a substantial collection of Roger’s aerial photos chronicling the ever-changing cityscape and transformation of the temporary Black Rock City – complete with typical city infrastructure – and the innovative Burning Man art installations both of which are created and taken down year after year. The collection also includes interpretive essays by William L. Fox, director of the Nevada Museum of Art’s Center for Art + Environment; Alexei Vranich, American archeologist at the University of California, Berkley; Tony “Coyote” Perez-Banuet, city superintendent of Black Rock City; and an introduction by Harley K. DuBois exploring the cultural context and impact of the Burning Man festival. Roger’s autobiography, In Search of the Common Shaman, also will be released next year by Smallworks Press. The mystical memoir is not just the story of Roger’s life, but it is also a reflection of the universal journey, the shared search for reconnection, and the moment of the “re-wild and re-energization of the divine power that dwells inside us,” as Roger describes it. His self-exploration is a powerful fusion of methods, ideas, and intentional mindsets seeking to revitalize the magic and mystical energy not only in his life, but within each person. Based upon the microcosm of personal experience, In Search of the Common Shaman explores more universal themes, combining enhanced connectedness, heightened experiences, and the intensified magical wonderment of life on earth. Roger is a contributor to the current No Spectators: the Art of Burning Man exhibit at the Renwick Gallery at the Smithsonian American Art Museum in Washington, D.C. Among his pieces are aerial photographs of Black Rock City, including the cover photo of Compass of the Ephemeral: Aerial Photography of Black Rock City through the Lens of Will Roger. The exhibit features large-scale installations – the artistic hallmark of Burning Man – and other festival items and runs through Jan. 21, 2019. In conjunction with No Spectators: the Art of Burning Man, Roger was a featured speaker at the Sept. 14 symposium, Radical Inclusion and Tales from the Playa: Talks on Art, Inspiration, and the History of Burning Man. His presentation covered how Burning Man has become an iconic cultural phenomenon in such a short time and what’s behind the development of Black Rock City. Will Roger discovered Burning Man in 1994, through his life partner Crimson Rose. Together and with several others, they are co-founders of Black Rock City, LLC, the company that has produced the Burning Man event for nearly 20 years. As a cultural co-founder of Burning Man, Roger also founded and managed the Black Rock City Department of Public Works – a team of several hundred people responsible for pre-event and post-event construction logistics and production. He is the co-founder of the Black Rock Art Foundation, a founding board member of Burning Man Project, and vice-president of Friends of the Black Rock/High Rock. Roger is heavily involved in conservation efforts for the Black Rock Desert, which is the United States’ largest National Conservation Area (NCA), and which is home to the Burning Man event. He served as Chairman of the Sierra Front – North Western Great Basin – Resource Advisory Council (RAC), and is currently a member of the RAC NCA Subgroup. Roger is also an accomplished photographer; and for nearly 20 years, he served at the Rochester Institute of Technology in Rochester, N.Y., as a photo chemist, administrator, associate professor, and assistant director. Founded in 2006, Smallworks Press specializes in arts and culture publications and treats each book with a commitment to impeccable production, design and marketing. With more than 100 years of collective experiences, the Smallworks Press team has enjoyed collaborating with a wide-spectrum of artists, authors and talent to create works with beautiful chromatic illustrations and stimulating interpretation with the finest print quality. Smallworks Press has fulfillment thru Midpoint (North America), a subsidiary of Ingram Content Group, and CBL Distribution (United Kingdom). For information, visit www.smallworkspress.com, email info@smallworkspress.com or call 702-577-6592. Join SAAM, five of the original founders of Burning Man, artists from No Spectators: the Art of Burning Man, and other Burners for a day of storytelling, short films, and discussions about the history of the event and the important role of art in its culture. For more information, please visit the Cultural Tourism DC Calendar. By clicking the image below, you will be cued to Will Roger’s Q&A with Megan Miller of Burning Man, as well as many other notable speakers. The Renwick Gallery might look like your classic, 1800s Smithsonian style building, but it’s a transformative space. Walking through the dimly lit dollhouses of Murder Is Her Hobby, the rooms feel much smaller and more intimate. As you crouch and press your face against the glass, it almost seems as if the ceilings have sunken lower. The gallery’s newest exhibition, No Spectators: The Art of Burning Man, has the opposite effect. These pieces tower far above you and almost touch the ceiling. Every piece fills the room to the brim, making full use of the space and playing off of the Renwick’s classic architecture. In an exhibition opening March 30, the Renwick Gallery has transported some of that Burning Man spirit to its more buttoned-down environs a stone’s throw from the White House. For the first time at the Renwick, an exhibition is spilling out of the museum’s doors onto the streets of downtown DC, with six large sculptures, including “Ursa Major,” taking up residence on sidewalks and medians through a partnership with the downtown-area Golden Triangle Business Improvement District. Will the Art of Burning Man Survive in Museums? At the end of the summer, for one week only, hundreds of giant fantastical sculptures and whimsical roving vehicles appear, then disappear like a shimmering mirage in the Nevada desert. We’re talking about Burning Man, the notoriously free-spirited annual spectacle that has occupied a dry lake bed outside Reno for nearly 30 years. Depictions of Burning Man tend to focus on the hedonistic antics of attendees, but from the beginning, when its co-founder, Larry Harvey, burned a wooden effigy as a summer solstice ritual on a San Francisco beach in 1986, art has been part of its DNA, and increasingly the museum world is taking notice. When Burning Man started selling tickets in the mid-1990s, it began giving away artist grants. 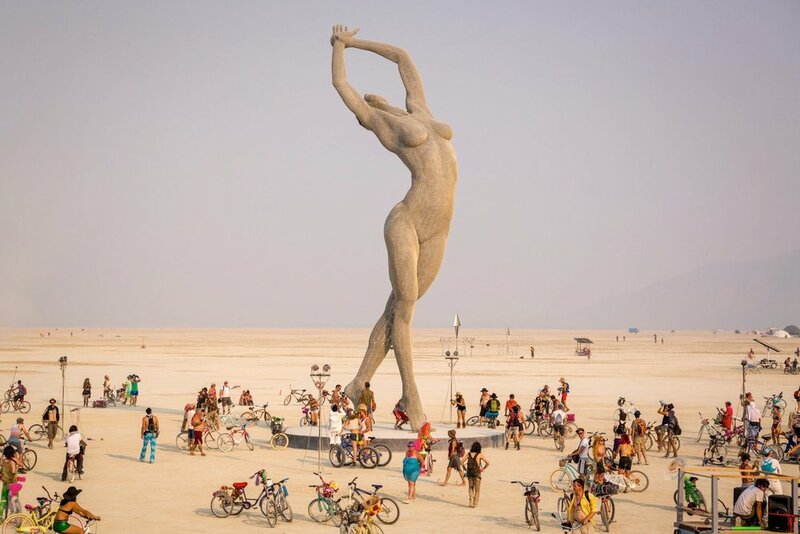 That support, now totaling around $1.3 million annually, plus quiet funding from Silicon Valley, has allowed Burning Man’s art projects to grow in ambition and quality. The Renwick Gallery of the Smithsonian American Art Museum will transform for No Spectators: The Art of Burning Man, an exhibit of enormous scale that is sure to create a sustained buzz all over DC and captivate visitors through Jan. 21, 2019. Each year in Nevada’s Black Rock Desert, a city of more than 75,000 people rises out of the dust for a single week. During that time, enormous experimental art installations are erected and many are ritually burned to the ground. The thriving temporary metropolis known as Burning Man is a hotbed of artistic ingenuity, driving innovation through its principles of radical self-expression, decommodification, communal participation, and reverence for the handmade. Both a cultural movement and an annual event, Burning Man remains one of the most influential phenomenons in contemporary American art and culture. No Spectators: The Art of Burning Man brings the large-scale, participatory work from this desert gathering to the nation’s capital for the first time. The exhibition takes over the entire Renwick Gallery building, bringing alive the maker culture and creative spirit of this cultural movement. Immersive room-sized installations, costumes, jewelry, and ephemera transport visitors to the gathering’s famed “Playa,” while photographs and archival materials from the Nevada Museum of Art trace Burning Man’s growth and its bohemian roots. In addition to the in-gallery presentation, the Renwick is expanding beyond its walls for the first time through an outdoor extension of the exhibition entitled No Spectators: Beyond the Renwick, displaying sculptures from Burning Man throughout the surrounding neighborhood in partnership with DC’s Golden Triangle Business Improvement District (BID). If you start talking about an event that takes place about 100 miles northeast of Reno in the desert in late August, most people in our area, and beyond, will know immediately that you’re talking about Burning Man. Burning Man has become a cultural institution worthy of a museum exhibition. “City of Dust: The Evolution of Burning Man” runs from July 1 to January 7 and then in the spring of 2018 it will travel to the Smithsonian’s Renwick Gallery in Washington, D.C. The exhibition at the Nevada Museum of Art in Reno traces the history of Burning Man from its modest San Francisco origins to a yearly event that attracts tens of thousands of people to Nevada’s Black Rock Desert. The exhibition traces the more than three-decade evolution of an event that has morphed from a bohemian beach gathering in San Francisco in 1986 to the modern-day 68,000-person pop-up city in Northern Nevada's Black Rock Desert each year. Burning Man’s founders open their vaults to share never-before-seen photographs, artifacts, journals, sketches, and notebooks revealing how this temporary experimental desert city came to be—and how it continues to evolve. Will Roger Peterson exhibits in Home Means Nevada, a photo exhibit celebrating Nevada's Public Lands. Some of the Silver State’s most spectacular landscapes went on display Monday in Washington, D.C., as a weeklong photo exhibit called “Home Means Nevada” debuted in the rotunda of the Senate Russell Building. Transformation is a huge part of the 70,000-person annual arts gathering in Northern Nevada's Black Rock Desert. What is lesser known, however, is how it has changed the lives of some of the people who created it. An short film documenting the dynamic relationship of inspiration, creativity and love between Crimson Rose and Will Roger Peterson. The film explores Burning Man's history, some of the myths and misunderstandings that surround and sensationalize Burning Man's culture, and how the event has come to survive, grow, and evolve by working closely with its neighbors. The film focuses on the challenges and benefits brought to Reno and its sibling communities which serve as the final outposts of civilization to these migrations, and on how Burning Man principles are permanently transforming the local arts and culture.